I believe the markets are on the verge of a significant move to the upside. There are too many signs that the bottom is behind us. However, the next few months' winners will not be totally obvious, and I think investors should be careful in their investment choices going forward. 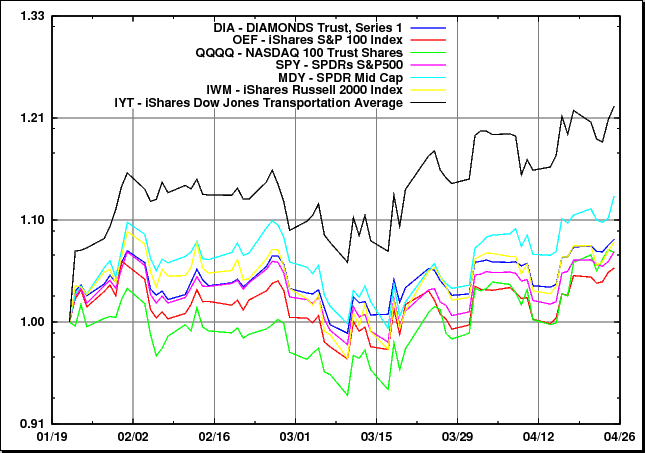 Key image: relative performance of US stocks major sub-indexes (plus the Dow transportation sector), since Jan 22, 2008. I believe the Fed's last interest rate reduction for a while is the one coming in the FOMC meeting next week. Most observers see a 0.25% reduction with the Fed signalling a shift to a more neutral bias. Given that we are close to the end of US rate reductions and given that Europe is behind the curve, I expect the US Dollar to gain strength again the Euro and this means a peak in (Dollar denominated) commodities, including oil, and precious metals. There are already signs of consolidation in the airline industry and much lower consumption of Jet fuel. Also as more people upgrade to more efficient cars (hybrid etc.) and driving less, it will start showing in consumption numbers. Recessions typically have a strong downward pressure on Oil prices. I'm selling all my Oil and Commodity holdings and focusing on different leaders. I was wrong in thinking that the recovery in US stocks will be symmetric (i.e. the most biggest recent losers would rebound to become the biggest winners.) In particular, at this stage, it is becoming obvious that neither Value, nor Small-Cap -- despite them being nicely up from both the January and March lows -- are the best place to be invested in. Not being much of a stock picker, I'm in the process of overweighting Mid Cap Growth. This is the broad-asset class that is showing the greatest strength since both January and March. My favorite ETFs here are IJK (iShares S&P Mid Cap 400 Growth Index), or if you prefer leverage: MVV (ProShares Ultra Mid Cap 400). Unfortunately, the leveraged Mid Cap Growth ETF (UKW), seems to have abysmal liquidity, if I ever decide to buy it, I would do it only on a day when/if it is extremely down. In general, leveraged ETFs should be bought only on sharp down days. My broker now offers free (non margined) cash-settled put writing, this is great news. If what I want to buy is a bit too high/overbought, I can write (sell) some naked put-contracts against it with a lower strike price. I get some free cash for the put contracts, while I wait for what I want to buy to dip and meet my wanted buy price. If this buy never happens and the puts expire, I just keep the cash I got for the put options. Just perfect for times like these. There's another pocket of great strength in the ETF IYT (Dow transportation sector) - a leading indicator of recovery. IYT closed well above the January bottom during the March bottom. This was a positive divergence that is now being confirmed broadly by the other major US indexes. Sharp market observers warn against falling into the value trap: buying value stocks just because they are cheap, only to see them get even cheaper. In this time of subprime hangover it may take a few more quarters to fully account for the damage and write off all the non-performing assets on the weaker balance sheets. House prices are still declining, ARM mortages still resetting, and consumer confidence is at a 30 year low. This continuing pressure will hurt any company that relies on big debt (is highly leveraged). 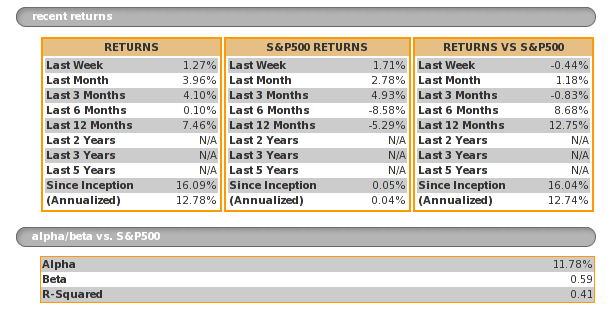 There are some great bargains in financials, but one should be very selective in picking the strongest players. Those with the best cash-flow and strongest balance sheets. Breadth (e.g. proportion of stocks trading above their 50-day moving average) is returning with a vengeance to the markets, so by this indicator, this looks like a good time to be broad. What about sectors? Right now, most sectors of the S&P are in overbought territory, (the 3 exceptions are Health Care -- neutral, Consumer Staples and Consumer Discretionary -- slighly above neutral) So one has to be careful: being wrong and narrow, at the same time may prove costly. The only sector I really like and continue to hold both in my account and in SZDM, is agribusiness (ETF: MOO) which is up a lot, and is very volatile (the "buy only on dips" mantra should apply even stronger here). Still, I think it still has a long way to go. Note that holding agricultural commodities and holding agribusiness stocks is not the same. Commodities in general are at extreme historical highs so I would avoid them. In contrast, MOO holds stuff like Monsanto (agri-science), Potash (fertilizers). These companies are now growing and doing very well because they are critical suppliers to the food producing chain, during a time of significant short supply. I just don't see the end of the agriculture/food crunch yet. For those looking outside the US, at this point only Latin America (ILF), especially, Chile (ECH) & Brazil (EWZ), and Canada look strong but there's a worry that the commodities boom is nearing an end so I would tread very carefully here. On Friday, the S&P500 index has closed at 1397.84. A hair shy of 1400. Many EMA lines and MACD crossover indicators are getting very close to giving buy signals. The amount of cash on the sidelines is now at 30-year highs (a very good long-term contrarian indicator). Looking at the 30 year chart of the ratio of Money Market Fund Assets vs the total S&P500 market cap shows very clear 4 sharp peaks at major market bottoms: July 1982, October 1990, October 2002, and right now. When the crowd starts jumping in we should see very strong upward movements in the markets. My Marketocracy SZDM portfolio is now almost at an all time high. I just got my first ever 3 green stars (1 year, 6 months, 3 months in the top 25%) thanks to the recent good calls on the imminent drop and what looked like a bottom in January (I was a bit early there). Moreover, the chart shows SZDM is now well above the m100 (best 100 portfolios on Marketocracy) average for the past year and since inception. 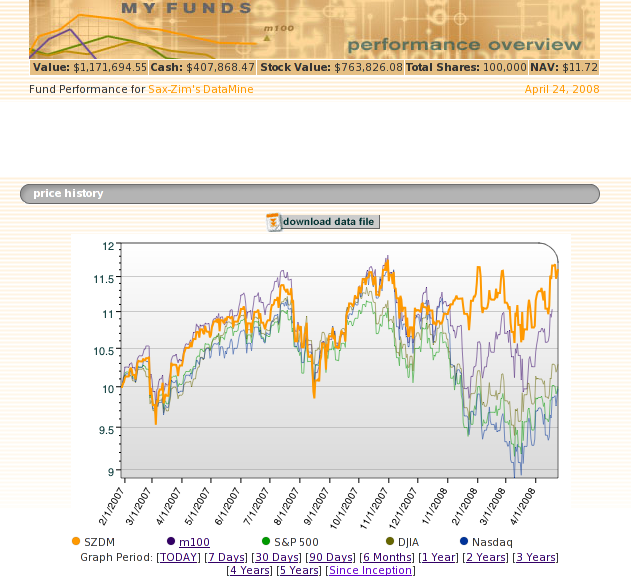 Here is the chart of SZDM vs the 3 major indexes and the m100 average since inception. The high level of cash is due to some selective lightening up last week. I intend to deploy it back soon.